Print, artist unknown, date unknown, British Museum. This is one of the first images that I collected for this project, but I've long resisted posting it. The main reason I've avoided it is the incredibly broad date for the piece. The British Museum estimates it as anywhere from the 1760's to the 1780's. Judging by the general clothing of the tars (with the bow in the short brimmed round hat, the close fitting striped trousers) and the women (which appears to be a style from the 1780's), I would lean toward a later date for the print. As with some of my previous prints, I'll ask for your help in narrowing the date! 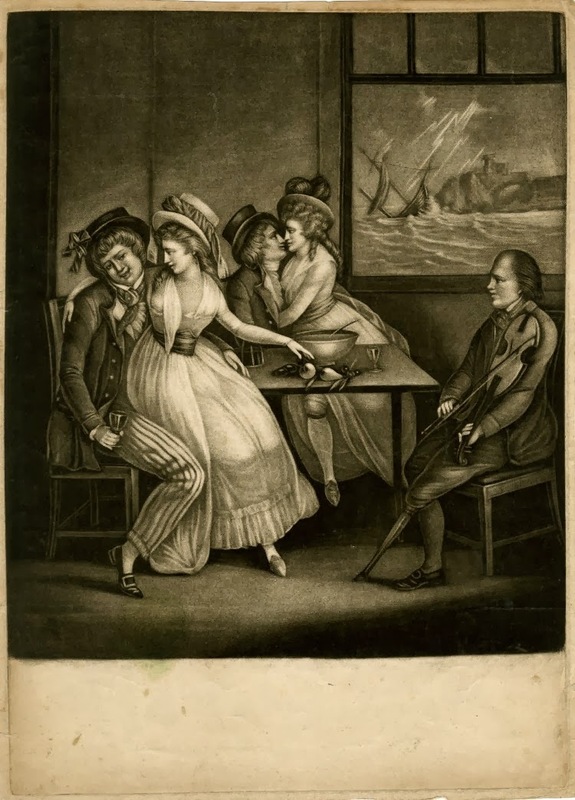 In a familiar scene, a pair of sailors court a pair of pretty ladies around a bowl of punch. 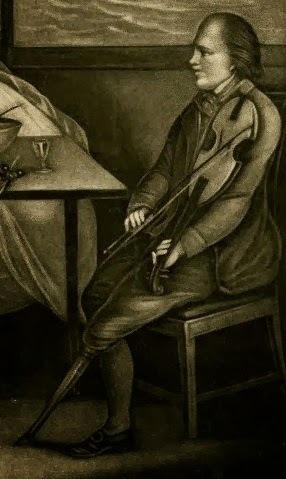 This time they are accompanied by a peg legged fiddler who does not look as jovial as the rest of the company. At the center of the piece and in the background is a tar entertaining his lass. They lean in for a kiss while she sits on his lap, showing a bit more leg beneath the table than is acceptable in good society. Her arm is buried beneath the lapel of his jacket, which itself is fitted with metal buttons. His neckcloth is white and fitted like a cravat. Perhaps it would be more accurate to conclude that this is a cravat and not a neckcloth, being as they are in shore-going clothes. Either way, the sailor's hat has an unusually high crown, almost like a top hat or coachman's hat of later years. The brim is narrow. His mate, also entertaining a maid, wears a round hat with a shorter crown though a similarly narrow brim. There is a large bow fitted to the hat on his right side. Like his mate, this tar wears a jacket with metal buttons, which appears to be unlined. At his neck is a dotted neckcloth, tied into a square knot. His trousers are striped vertically, and his pointed toe shoes have rectangular buckles.